As frigid weather descended upon us here in the New Orleans tropics last week, we decided comfort food might help us muscle through it. Vann came up with a great recipe for Burgundy Beef Stew, found in the Living section of our local newspaper, that we then adapted a bit to make our own. Delicious, warming-to-the-bone and somewhat healthy, too! This is the original recipe. We didn’t bother with the dumplings, but if you do please let us know how they turned out. Instead, we opted for a baguette with garlic butter. Any changes made to the original recipe are in parentheses. 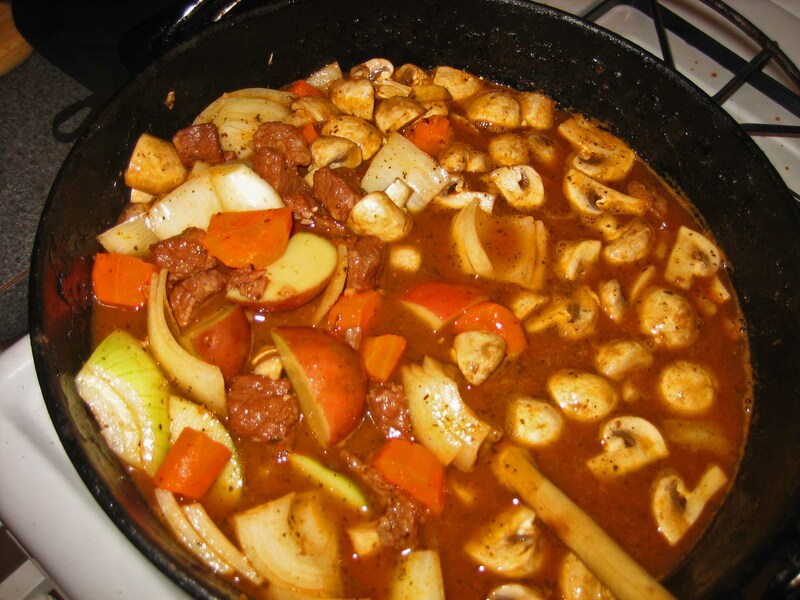 Heat oil in a Dutch oven or deep skillet over high heat.. Add beef and garlic. Sauté 5 to 7 minutes until beef is browned. Add broth, wine, tomato paste and thyme; bring to a boil. Cover, reduce heat, and simmer 1-1/2 hours or until steak is tender. Add potatoes and next five ingredients. Simmer, uncovered, 30 minutes or until vegetables are almost tender. Combine cornmeal, bread flour, baking powder, salt and thyme in a bowl until well blended. Add butter and milk, stirring to blend. Cook as directed in main recipe. Scoop dough for dumplings by rounded tablespoons on top of stew; cook over low heat, uncovered, 10 minutes. Cover and cook 18 to 20 minutes, until dumplings are done. Avoid boiling mixture to prevent dumplings from falling apart.